Designed by Arne Jacobsen in 1955, this is perhaps the classic shell chair and is still in production. It is made in remarkably thin laminated wood with either a wood veneer or the shell is painted. There are also upholstered versions. 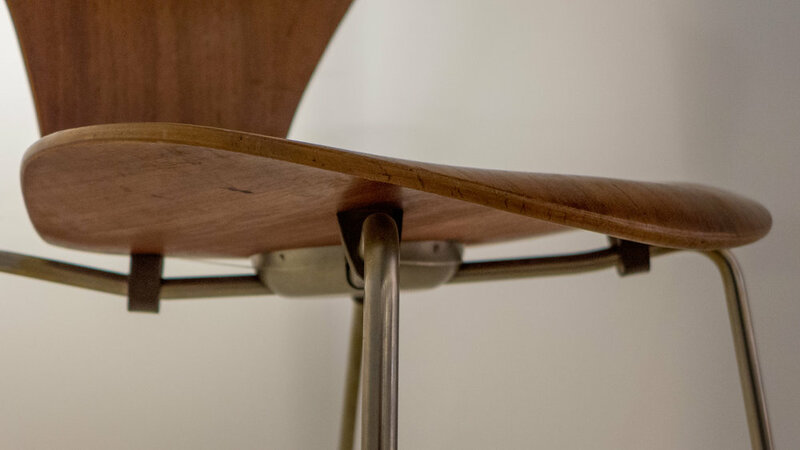 Thin metal legs are bent and meet at a central circle of wood applied to the underside of the shell and with a cover, originally metal and later plastic. There are spacers before the elbow of the leg to hold the legs in position and dampers that ensure that the seat is neither too rigid, making the chair uncomfortable, nor too flexible making the sitting position seem unstable. The chairs are light and they stack which makes this a popular option for institutional use, such as meeting spaces or temporary lecture rooms but, of course that can be useful in an ordinary home if space is tight or if extra seating is only needed occasionally. Model 3107 was also produced with arms (model 3207) and with a swivel base for an office chair and the shell can be fixed directly to a step or beam in an arrangement for theatres or auditoriums.